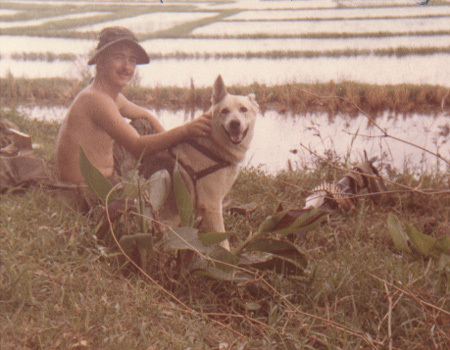 This photo shows Ken “Dunc” Duncan of Crystal City, Mo., relaxing with a mine and booby trap dog named “Prince.” The dog handler was David “Red” Cook of Falls Church, Va. The 2nd CAG Command Chronologies say the VC pulled their booby traps out of areas worked by mine and booby trap dogs. I know we patrolled with a lot more confidence when “Prince” was along to sniff at anything suspicious. This photo was taken in the hamlet of An Tu in the western part of the 2-7-2 AO.